Tarika Valli é uma bailarina da tradição de Pandanallur através dos ensinamentos dos mestres Smt Amala Devi (Paris), dos célebres bailarinos Sri Ram Gopal, Sri U.S. Krishna Rao e Smt Bhaga Devi de Bangalore. Actualmente continua o seu trabalho em Paris com os mestres Sri Dayalasingam e Vasundhara Filliozat. Criou os seguintes espectáculos : «Aum Nmah Sivâya», «Hari-Harânjali», «Pâdâsraya» entre outros. Deu, até ao momento cerca de 300 recitais em França e no estrangeiro. Dirige estágios em Portugal e França. Tarika Valli is a dancer of the Pandanallur tradition by the knowledge of the master Smt Amala Devi (Paris), the famous dancers Sri Ram Gopal, Sri U.S. Krishna Rao and Smt Bhaga Devi of Bangalore. Actually works in Paris with the teachers Sri Dayalasingam and Vasundhara Filliozat. She created the following performances: «Aum Nmah Sivâya», «Hari-Harânjali», «Pâdâsraya» among others. She gave until now about 300 recitals in France and abroad. 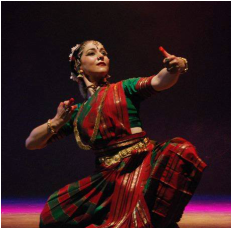 She direct several Indian Dance workshops in Portugal and France.